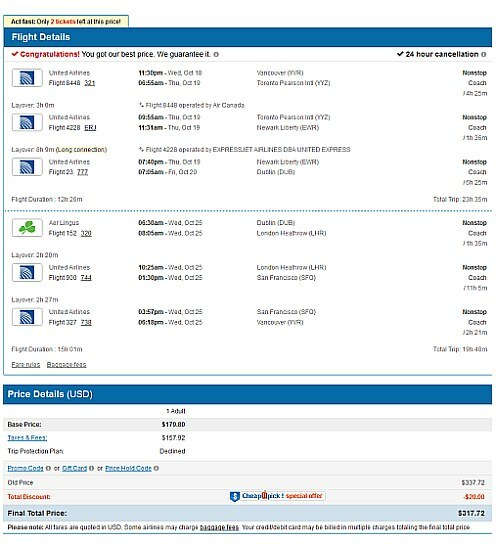 I'm seeing some interesting fares from Vancouver to Dublin, Ireland for $376 CAD roundtrip over St. Patrick's Day. However, most of these flights have 2 stops each way, using a combination of United Airlines and Aer Lingus - and it's not really clear whether these prices are a mistake or not. Update 9/20 - @ 9:30 AM PST - I've seen reports of some of these bookings being cancelled, while others were issued an e-ticket. 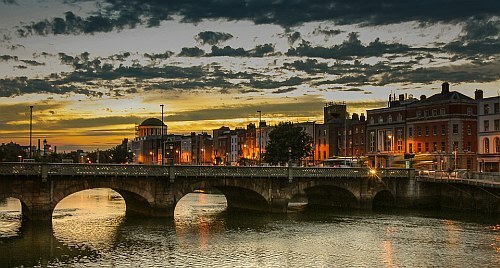 flight deals, europe, northern europe, western europe, dublin, ireland, dub, calgary, yyc, united airlines and aer lingus. 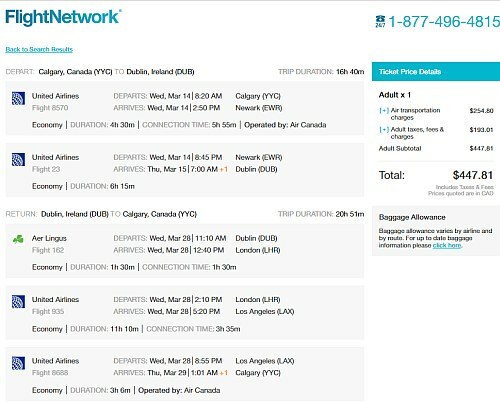 3 Responses to "Vancouver to Dublin, Ireland - $376 CAD roundtrip including taxes (St. Patrick's Day)"
I just booked through first checking Momondo, then booking through Flightnetwork. All in all it was $810 for two of us.. And we get to be in dublin for St Patricks Day!! I booked a week in October and another week in February, both thru GoToGate and both received e-tickets. So far NOT cancelled as of 4:01pm Pacific Time on September 20th.